After the more than successful market introduction, ARISTO once again increases the productivity of their large GL-machines. With a completely new steering system, the throughput for large format processing with these production machines has been improved considerably. This makes the plotter even more interesting for automated volume production, from panel or roll materials. Impresses with its non-fussy design and concentration on the basic essentials: a from all sides freely accessible work surface, extremely robust traverse bridge with minimal protruding at the sides and belt drive in all axis for slip-free drive. Powerful AC-servomotors enable the high throughput and the modern CAN-Bus-steering technique reduces the number of mechanical parts. Simple operating The CutterControlPanel Software offers totally new possibilities of user guidance. Via PC-screen, all necessary information on cutting data is graphically depicted and the user can comfortably steer the processing functions via mouse click. 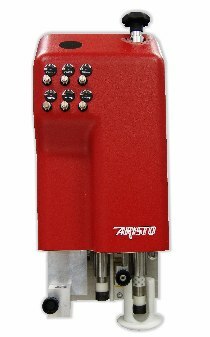 ARISTOMAT Grand Line Series - High speed cutters with most modern technology Basic functions, such as hand steering or setting the origin, can be carried out from any area of the cutter using the mobile operating unit. To automate the processing, the machines can be supplemented with a revolving conveyor and a powered winding device for roll materials. for oscillating cutting, fixed cutting, scratching, creasing, marking...without having to carry out a tool change.. With up to three tangentially-steered tool axis and one or two marking modules to hold various pens, the MultiHead IV offers all of this. This variety of possibilities for material processing can be supplemented with an integrated colour camera for the automatic measuring system Automatic Eye and the combination of a high-frequency routing spindle with a controlled z-axis. So can, for example, a printed material panel be measured by the Automatic Eye system and subsequently cut out exactly on the outlines. Operating Universal control software CutterControlPanel for Windows XP;multilingual: English, German, French, Italian, Polish, Dutch, Czech, other languages on request. Mobile control pad. * The dimensions only refer to the basic machines without tool head, material transport systems and unloading table. ** Work area for one tool. With machines with conveyor the work width is reduced by 100 mm.